My husband and I have been dining at Thai Taste for almost two years now. A friend of ours took us out to dinner there and called it “The Center of the Universe”. I believe he meant the center of his universe at the moment since all of our mutual friends also loved it there. We returned often and decided on our favorite dishes: Mark would get the Pa-Nang and I would get the Pad Thai. This was when I was vegetarian and thought simply choosing tofu as the meat made everything edible. My recent turn towards veganism now has me investigating what goes into my meals, which in the case of Pad Thai had unfortunately been fish sauce. I asked our waiter Lay if he could tell me which items on the lunch menu were vegan and he was so helpful! 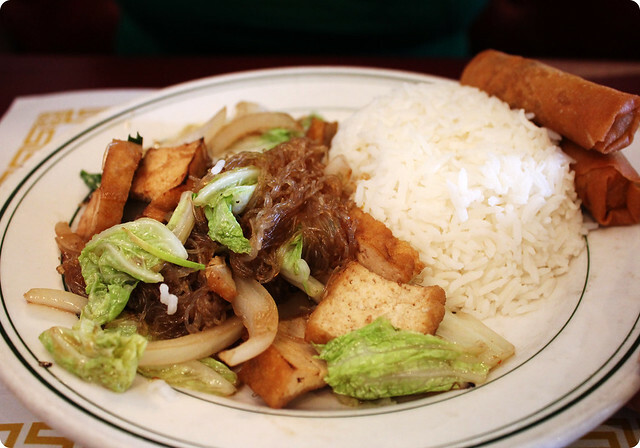 It turns out that half of the lunch menu if ordered with no egg, tofu as the meat and white rice is vegan. You’re also able to substitute the non-vegan soup for an extra spring roll with your meal which is both delicious and vegan! Lay recommended the two dishes photographed and they were both delectable. 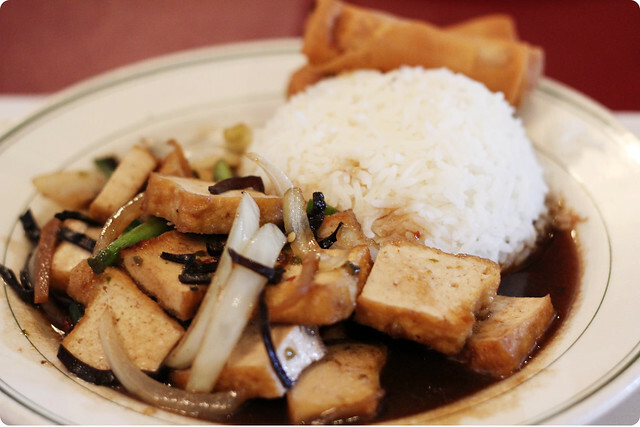 The tofu they use is always cooked to perfection and the food is always hot and made to order. I loved the brown sauce in Pad King and the rice noodles in the Pad Woon Sen.We took some time to take the photographs and the food was still nice and warm by the time we put our camera away and started to chow down. The lunch special menu is listed numbers 1 through 12. The following lunch menu items are vegan: 1. Pad Kra Prao, 2. Pad Prig, 4. Pad King, 5. Pad Woon Sen, 7. Pad Pak and 9. Sweet & Sour. The special includes a tea, two spring rolls (if no soup is requested) and the entrée for only $5.95 from 11am to 3pm Monday through Saturday. Thai Taste normally gets a lunch rush from the surrounding businesses, but the people who work there have always been so friendly and the service fast no matter how busy. From the outside it is completely unassuming, you wouldn’t expect such good vegan food, but it comes highly recommended! This entry was posted in Local Restaurant Reviews and tagged San Antonio, Vegan. Bookmark the permalink.